by so many elaborate, and often untruthful, explanations and excuses. Hawaii in January of 1969.
supposed to be the Universal Form. MacMillan removed the extra arms of the Universal Form, making it into Lord Vishnu, and they also condensed Srila Prabhupada’s Gita manuscript down to a much smaller edited version. whole thing printed. His entire Bhagavad-gita As It Is was thus print-ready for publication then — in late 1968.
since there was no certainty that the book would sell, MacMillan cut it to the bone. Srila Prabhupada’s lengthy Bhagavad-gita manuscript was cut down to small paperback size for MacMillan’s economical reasons. trees,” (to be changed to “the pitris”), and a couple of other small corrections. Had only those few changes been made, perhaps this controversy would never have occurred. alone, and thus changed the “writer’s voice” that had been so artistically created by Srila Prabhupada and Hayagriva working together. sutras, Plato, Saint Augustine, and Hindu books on theology. will see that Hayagriva was spending time daily with Srila Prabhupada doing this editing work. It is an undisputed fact, clearly written in Hayagriva’s diaries from 1966 and 1967.
cover, since my drawing was to be used. We were very involved with the whole process. That first Gita, the purple one, was printed only a few months after I went to Hawaii in January of 1969.
as well as other books. It was at that time that Prabhupada married Hayagriva to Shama dasi. comfortable home situation for him. hours of the morning, around 2:00 am, and spend hours speaking his books into his dictaphone. Later in the morning, he would hand me a tape to type–even sometimes two tapes! that I could draw the scene of the altar. He supervised everything. 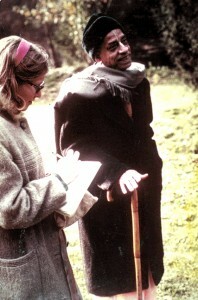 Srila Prabhupada was very involved with every part of his book production process, from the conception of paintings to the final choice of size and color. why Srila Prabhupada’s books have been edited and changed so drastically. I have no personal dislike or antagonism for Jayadvaita Swami, or for Dravida Prabhu. We were always friends. But this issue is one that we cannot agree upon, because it is clearly a disregard for Srila Prabhupada’s platform as Acharya. Bhagavad-gita As It Is for the Prabhupada Centennial. Her requests were ignored by the BBT. editor’s name is on the cover as well–not just Srila Prabhupada’s name, as has been done by the BBT. The rule is that the public must know up-front that the book has been edited and/or abridged by so-and-so. come after Jayadvaita Swami and Dravida Prabhu are gone will surely have new and different ideas, and in due course of time, the pure teachings will be lost. Just like the instructions Krishna gave to the Sun God. Just as Krishna says in the Gita that “I gave this knowledge to the Sungod, but it was lost in the course of time,” the same thing will happen to Srila Prabhupada’s books if we allow this book change issue to go unchecked. There is no end to it. it all sound all right. As a disciple, you and I and every one of us has a duty to Srila Prabhupada, to his legacy, to safeguard his valuable teachings for the generations of devotees to come. That is our most important duty.